1/1, October 15, 1892-September 15, 1897. 8 pp. 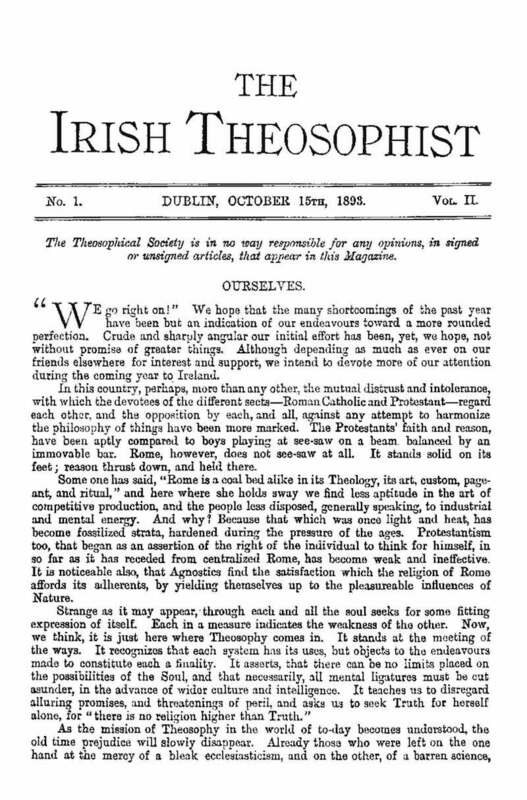 Published by the Dublin Lodge of the Theosophical Society, the journal was one of the most thoughtful of Theosophical periodicals. Contributions by W.Q. Judge, G.W. Russell ("AE") and W.B. Yeats (under the name "D.E.D.I," "Demon est Deus Inversus"), with studies of Irish folklore and extensive discussion of of the Besant/Judge split in the Theosophical Society. Dunlop later edited Anthroposophy (London) and The Path (London). University of Texas, Austin.